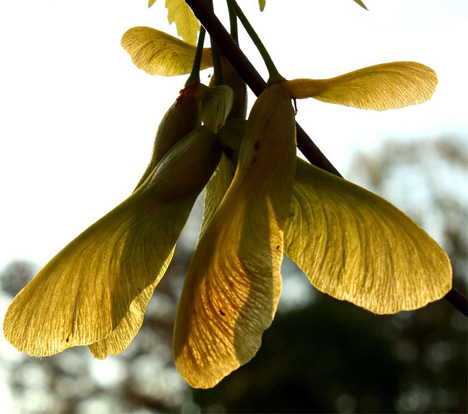 Remember grabbing handfuls of maple tree “helicopters” as a kid, throwing them up into the air and watching them spiral back down to earth? 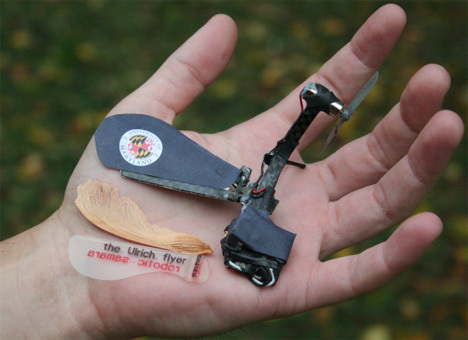 A group of students at the University of Maryland’s Clark School of Engineering drew on those memories to create the world’s smallest controllable single-winged aircraft. They were faced by challenges, such as how to keep the tiny aircraft from being knocked off course by a strong gust of wind, but their project created the first known successful artificial samara. Tiny robotic flying vehicles like this could be used to investigate unsafe or inaccessible areas, such as those present in military or rescue operations. The robotic samara uses the same sort of spiral rotation as the natural samara, but it also contains a stabilizing factor and a propulsion factor that allow it to be controlled remotely and to hover in the air. It can be dropped from a high altitude and controlled during descent, but it can also take off from the ground. Using inspiration gained from nature along with innovative engineering, the UMCP group may have created a vehicle that vastly improves the way surveillance, fire monitoring, rescue missions and other life-saving missions are carried out. Their invention has undergone several makeovers since it first came to life, and no doubt the team will continue to refine it in the future. See more in Robotics or under Technology. December, 2009.